Appearance: Aeolynn has medium length brown and caramel hair that is angled so the hair in the front is longer by about four inches then in the back, light smokey green eyes and a short compact body. Standing at 5'4" even, Aeolynn is fit with broad shoulders and an iron gaze to match, as many find her eyes very powerful. Simple earrings made from the iridescent emerald tail feathers of a rooster adorn her ears. 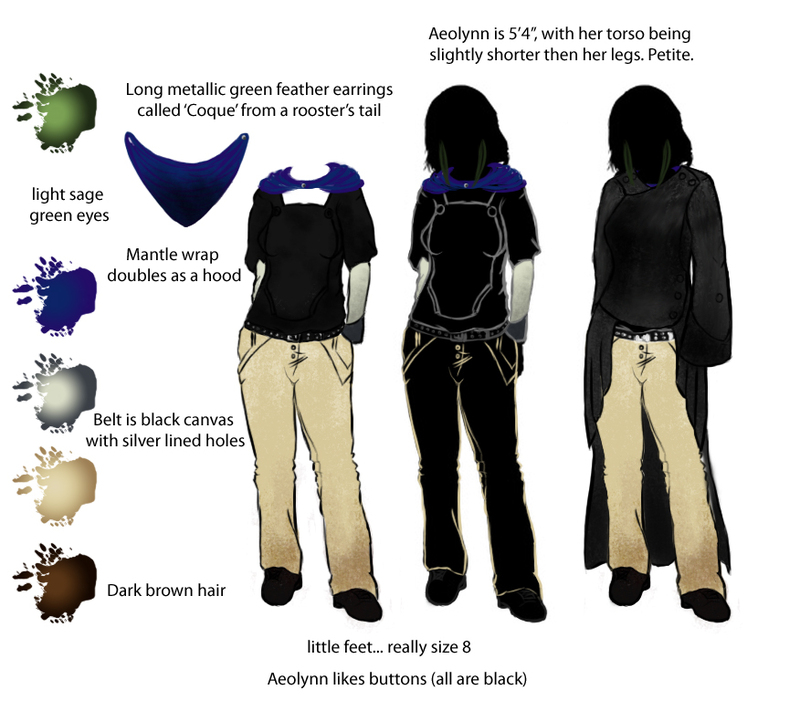 Liking dark colors, Aeolynn tends to wear a lot of browns and blacks with some garment, usually a scarf that is much brighter in comparison. Normally she has on a formfitting black sweater, with two layers of sleeves, one ivory, and the second and last a dark gray. An ebony canvas belt is around her hips, khakis stained from travel at the feet protect her legs from the ground. A mantle wrap of her own making is her current favorite bright article of clothing, being a dark purple and blue mix that fades to the tip. Also doubles as a hood if she happens to come across rain. Several main scars dot her skin, the most visible are two thin and slightly jagged lines running parallel to each other on her right temple. Both are only an inch long, but they are the most painful of them all, as they are the first cuts Taebold inflicted upon her when she was younger. Another is a nick on the right side of the bridge of her nose from a barely deflected arrow from her first fight with Kroescolo. Many scars of torture line her back, palms and feet, but she tends to keep her clothes on to cover them. Aeolynn has a unique mark between her breasts. A symbolic star formed over her heart made up of glowing coals proves that she is the Charred Heart, borne of legend. She has stolen so many souls, insomuch that she retains all of the elements, and the mark shows that she is under soul-strain, fighting to keep herself apart from the souls of her enemies. It is a constant battle, and she often has to fight within herself while dealing with enemies, as the soul of the most evil try to sway her actions to their will. Personality: Sure spoken, calm and thoughtful, she is good at reading people and is very aware of most everything that goes around her. Aeolynn is an incredibly unselfish person and would go to great lengths to help her friends at any cost, dear to her or not. She tries to make the most logical decisions and prefers not to dawdle, making her somewhat of a blunt person. Background: Born to a family of five, her sister disappeared long ago when she was only seven, when Kroescolo made his first appearance. A few years later her uncle unleashed a devastating disease upon their village, wanting to make sure his lineage was destroyed. 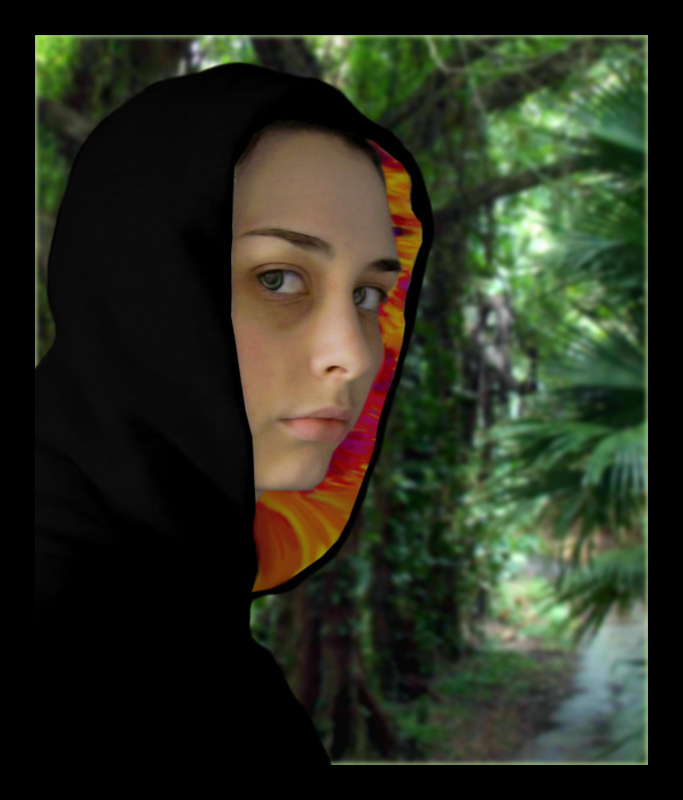 Aeolynn and her twin brother Myrin were the only ones to survive. They were kidnapped by said uncle and held under imprisonment to be tortured daily. Their captors did many horrible things to them and over the span of four years finally Aeolynn used her hidden multiborne lineage to kill Taebold, the one that had held her a breath from death for so long, all for the sake of releasing her powers. 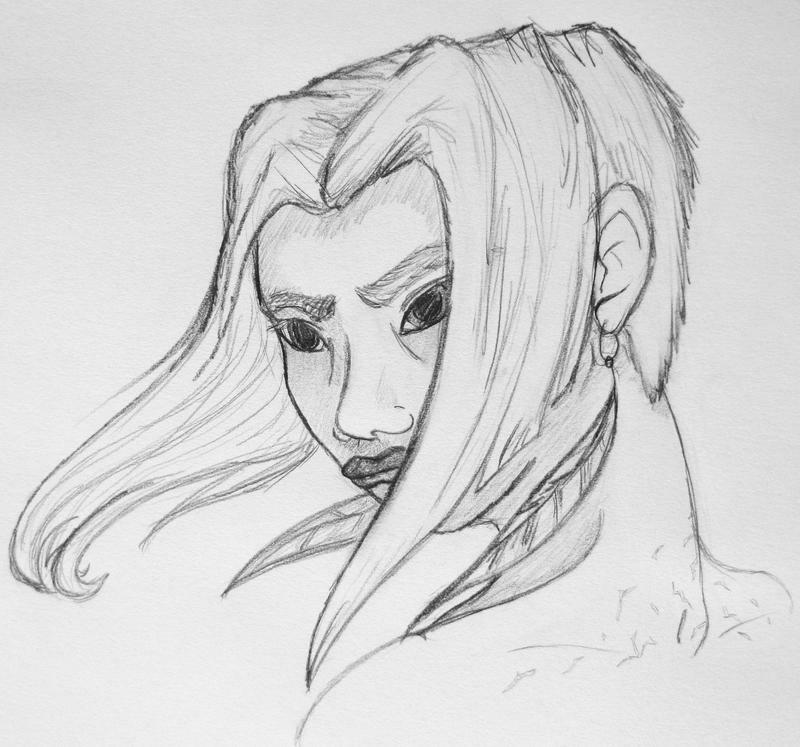 Many years have elapsed since then, but Aeolynn still bears the scars of her past. Special Qualities: Originally, Aeolynn only had her one element, wind. She is beyond exceptional at controlling it, however, she is much less confident in the elements that she stole from her enemies. Ice specifically is her weakest, being from Taebold. Aeolynn has the ability to use wind as a blade, as well as being able to summon tornadoes. When she uses the other elements, it is mostly for their physically manifested forms; Darkness for the silent wings, Earth for armor, etc. Weapon(s): Aeolynn carries a hidden roll of special needles that are in separate cases around her left forearm. Other then that, she does not have any other physical weapons. In truth, she herself is one. Weakness(s): Though she may look confident, Aeolynn is always second guessing herself and her ability to appear calm is simply a mask. Her emotional state is very fragile, and ever since the night she killed Kroescolo, and became the Charred Heart, she has not menstruated. As per her blood she has the 'stealer' incantation, a four lined spell which in order for it to work you need time to focus on the target as well as time to speak it. If not, then it might react in an unpredictable manner. As my el'ment takes it's hold. Elemental Creature: Teirrol is by no means a small air dragon. He is a good thirty feet long, and standing at 6 feet at his shoulder. Unknown to many, Teirrol is actually the first ever elemental creature, having first bonded with Zephire, the wind goddess. Later in Aeolynn's life, she sent him to aid her. He appears to have a white hide, with crystalline eyes that are faceted, however he normally is kept hidden and invisible in the breeze. His build is odd. Teirrol has short forearms and very large, muscular back legs. He tends to use his wings as a first set of arms like a wyvern, saving his small arms that have wickedly sharp claws for a battle. Much like many bonded, they communicate through the mind, having a knowledge of where the other is at all times.